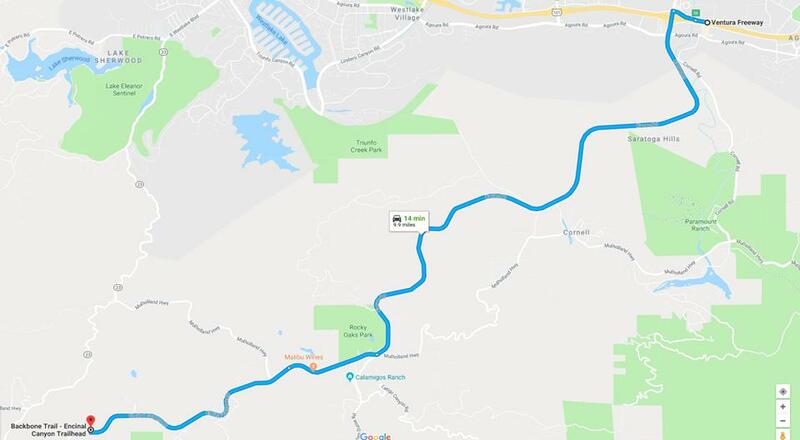 HIKE TYPE: This is a point-to-point hike, meaning we’ll leave half of the cars at Encinal Canyon Trailhead and drive the other half to Mishi Mokwa Trailhead, about 15 minutes away. After the hike we’ll shuttle people back to retrieve their cars. 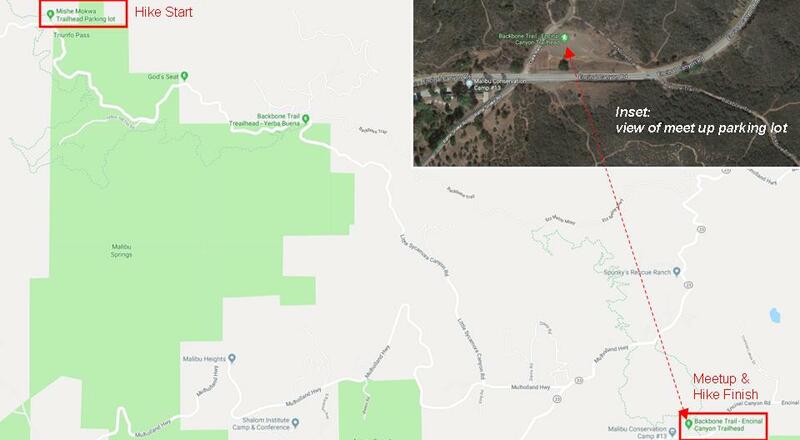 on Road and Rattlesnake Road, across from Malibu Conservation Camp #13 at 1250 Encinal Canyon Road. It’s about a 70 minute drive from downtown Los Angeles on a typical Sunday morning. There’s a Ralph’s, Von’s and Starbuck’s just north of the Kanan Road exit if you need to make a stop on the way. Please allow sufficient time so you arrive on time after purchasing any goods. HIKE WALKTHROUGH: This hike starts near our Mishi Mokwa / Sandstone Peak hike but goes east instead of west. Ten miles and only a Level 5? Actually a generous Level 5. This is a beautiful strolling hike through lush chaparral and native meadows, mostly on new trails designed to modern standards (all user groups, four feet wide, gradual grades). We’ll gain 400 feet during the first two miles, passing wild sages, cucumber, mint and manzanita. 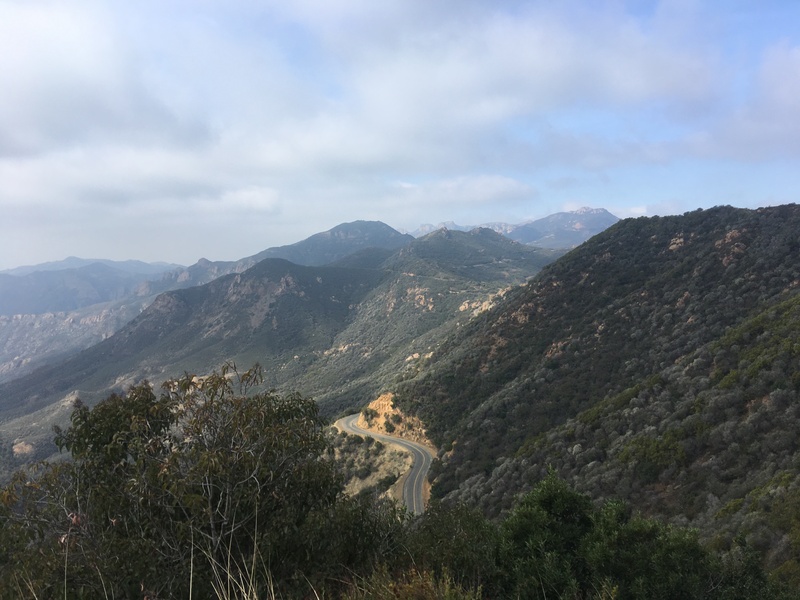 Over the next 3 miles we drop a few hundred feet along Encinal Canyon before tackling our only brief aggressive stretch to a hilltop lunch spot. From there we gently descend 1000 feet over 5 miles of green mountains. This stretch is popular with mountain bikers and trail runners as well as hikers. WATER REQUIRED. WATER CHECK WILL BE PERFORMED: If you do not take enough water or are not appropriately equipped for this hike, you will be turned away from doing this hike with us even if you show up. Please note, that we have expectations for Level 5 hikers. Read all the details. While we are walking through one of the most forested chaparrals in Malibu, warm temperatures and the sun’s reflection off of the rocks and soil can demand sufficient water. REQUIRED: at least 2 liters or at least three 20 oz water bottles), 2-3 liters recommended. Comfortable hiking/sports shoes with good grip. RECOMMENDED: A good snack / lunch and comfortable walking shoes, sunscreen/lip balm, bug spray, good sized snack or snacks. – Except for a short stretch on fire road, the trail is wide, quite smooth and has comfortable slope changes. Experienced hikers will be comfortable in trail shoes, and boots will work fine. – We can encounter up to 20 degree temperature changes throughout the day. Dress in layers as suits you. – A hat and sunscreen are advisable. – For last minute needs, there’s a restroom ~ 1/2 mile from Mishi Mokwa Trailhead if needed. RESTROOMS: There are no facilities along the trail. There’s a restroom at Sandstone Peak Trailhead, about 1/2 mile from our hike start point.